By Ralph Rio, VP Enterprise Software, ARC Advisory Group. Most asset-intensive industrial organisations find it increasingly difficult to assure high asset reliability and low unplanned downtime. As the vast installed base of industrial assets continues to age, the need for maintenance increases, while at the same time, competitive pressures and commodity business models force executives to control costs. A compounding factor has to do with an ageing workforce where experienced staff is retiring and organisations are finding it difficult to hire replacements with the needed skills and capabilities. 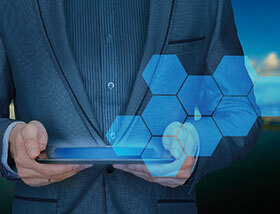 This conundrum drives adoption of the IIoT and analytics to move to higher-maturity strategies with predictive and prescriptive maintenance. Higher maintenance maturity supports both production and C-suite objectives. Key performance indicators (KPIs) for asset management focus on uptime, asset longevity, cost control, safety, and quality to support production. These KPIs also directly affect C-suite metrics of revenue, cash conservation, profitability and risk management. The C-suite’s metrics involve the profit and loss (P&L) statement and balance sheet that financial analysts and potential investors carefully scrutinise. Preventive maintenance is the optimum approach for just a small portion of assets. Data on failure patterns from four different studies show that only 18% of assets have the age-related failure pattern appropriate for this approach. The other 82% of assets require predictive (single-variate) or prescriptive (multi-variate) maintenance, both of which are higher on the maintenance maturity curve. • Adopt a packaged/standard platform for IIoT and analytics. • Create models that predict failures for key asset types. • Apply the models across many similar assets. Operations groups obviously depend on good asset management and maintenance to achieve production objectives for on-time delivery with in-spec quality at minimum cost. To meet these goals, production needs the equipment to be available (uptime) and performing as required (capable). High uptime with low unplanned downtime becomes the key metric for maintenance. Uptime has been shown to be the top metric in multiple ARC surveys among maintenance and operations personnel over the past decade. Fundamentally, higher uptime enables production operations to perform optimally. Per the survey results, the asset management KPIs focus on uptime, asset longevity, cost control, safety, and quality. They directly affect C-suite metrics of revenue, cash conservation, profitability and risk management. The C-suite’s metrics involve the P&L statement and balance sheet that are scrutinised by financial analysts and potential investors. Uptime: Unscheduled downtime causes losses in direct labour and, often, work-in-process (WIP) materials. These losses have a direct negative impact on profitability. With just-in-time (JIT) scheduling and minimal inventory, the production interruptions also cause missed shipment dates, customer satisfaction issues, and reduced revenue. The resulting lower revenue negatively impacts P&L. Uptime also affects inventory and the balance sheet. Manufacturers typically have a queue of materials between operations to buffer interruptions, particularly equipment failures. Higher equipment uptime reduces uncertainty and allows for lower inventory. This conserves cash and improves the balance sheet. Asset longevity: Good asset management extends the useful life of assets, delaying the need for costly capital projects to replace or refurbish those assets. Avoiding capital expenditures conserves cash. With more cash, financial metrics improve, along with stock prices. Cost control for maintenance: The demise of a relatively expensive component often cascades onto other system components (just as the loss of R60 of engine oil can cause a car’s engine to seize, leading to a R5 000+ repair). Without appropriate maintenance, repair costs can escalate dramatically. Safety and risk management: Catastrophic equipment failure can put nearby people in danger. Also, failure of a major system can cascade into other systems, representing a significant business risk. Governance, including Sarbanes-Oxley compliance, necessitates good asset management. Maintenance practices can generally be classified into four types: reactive, preventive, predictive and prescriptive. 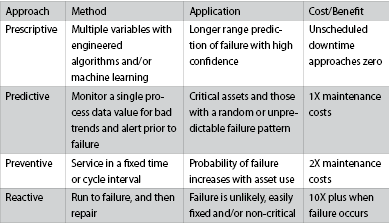 Reactive (run to failure) is the most common approach to equipment maintenance since the majority of assets have a very low probability of failure and are non-critical. This is appropriate in many cases and helps control maintenance costs. However, when a failure does occur, the impact of the broken component can cascade into other components and become a major expense. Clearly, this approach is appropriate only for non-critical assets. Manufacturers often employ a preventive maintenance approach. Here, maintenance is performed based either on time (analogous to replacing the batteries in your household smoke detectors once a year), or usage (changing your car’s oil every 5,000 miles). Preventive maintenance fits when wear with age, run-time, or number of cycles can be used to predict failure (i.e. assets with an age-related failure pattern). Periodic inspections and condition evaluation are often used for stationary plant equipment such as steam boilers, piping, and heat exchangers. Predictive maintenance (PdM) uses condition monitoring to predict when something bad is about to happen and provide a warning in advance of failure. This allows time for scheduling and performing the appropriate maintenance to prevent unplanned downtime. Typically, the monitoring involves a single asset attribute, such as vibration or temperature. Applications involve the more critical assets for which failure would significantly impact uptime, asset longevity, safety, product quality, or involve major repairs. Prescriptive maintenance combines ‘small data’ (from a particular device or system) with algorithms that model that type of equipment (virtual equipment or ‘digital twin’) to monitor condition and raise an alert when needed. The data from multiple sensors in a particular device, combined with algorithms engineered for that type of equipment, provide a means to assess condition and identify a problem. One benefit of a specific algorithm or model for a type of equipment is the ability to replicate it like a template across many similar devices – like doors on a passenger train or transformers in power transmission lines. Preventive maintenance assumes the probability of equipment failure increases with use, and schedules maintenance based on calendar time, run time, or cycle count. However, data on failure patterns from four different studies show that (on average) only 18 percent of assets have an age-related failure pattern. Thus, preventive maintenance provides a benefit for just 18 percent of assets. Doing preventive maintenance on the other 82 percent may well cause failures by placing some assets at the beginning of the curve for early life failures. Predictive and prescriptive maintenance using IIoT and analytics identify the randomly occurring faults that lead to failures. These more mature asset management approaches provide an appropriate maintenance strategy for the other 82 percent of assets. • Maintenance costs reduced by 50%. • Unexpected failures reduced by 55%. • Mean Time Between Failures (MTBF) increased by 30%. • Machinery availability increased by 30%. Issues with the ageing workforce include the difficulty that industrial organisations are having hiring replacements with the needed skills and who are willing to work in an often less-than-glamorous industrial setting. Some have forecasted double-digit reductions in the available workforce for industrial companies in developed countries. With the combination of fewer people and continually ageing assets, more effective maintenance practices are required. Performing maintenance when conditions warrant (prescriptive or predictive) rather than periodically (preventive) requires less labour and can thus help mitigate issues associated with the ageing workforce. Results from an ARC survey on enterprise asset management (EAM) show that organisations on average have room for improvement. On the good side, preventive maintenance approaches exceed reactive. Thus, most organisations have avoided devolving into a run-to-failure maintenance practice that would result in mostly corrective or emergency work assignments. However, adoption of predictive maintenance – even though this is twice as effective as preventive maintenance for appropriate assets – has low adoption. ARC’s research indicates that most predictive maintenance has been implemented as custom, point solutions. This is a brittle approach, since changes in related systems cause the software to break. The project members have often moved on to other activities and the predictive maintenance application falls into disuse. In contrast, IIoT platforms with services for analytics offer a common platform for a more sustainable approach. Unfortunately, with manual processes, even alerts triggered by predictive or preventive maintenance tend to get lost, leading to equipment failure and associated downtime. But, integrating the alerts into other applications with business process automation (BPA) helps assure that this does not happen. To avoid alerts being received and ignored, technicians need to be provided with information to help them understand and diagnose the problem. Higher maintenance maturity supports both production and C-suite objectives. KPIs for asset management focus on uptime, asset longevity, cost control, safety, and quality to support production. These KPIs also directly affect C-suite metrics of revenue, cash conservation, profitability and risk management. The C-suite’s metrics involve the profit and loss (P&L) statement and balance sheet scrutinised by financial analysts and potential investors: meeting these needs for improved asset reliability while controlling costs requires a higher asset management maturity. Preventive maintenance is suitable for a small portion of assets. Data on failure patterns from four different studies show that only 18 percent of assets have an age-related failure pattern appropriate for this approach. The other 82 percent require predictive (single-variate) or prescriptive (multi-variate) maintenance. This study shows how newly emerging technologies – IIoT and analytics – allow specific types of critical assets to have near-zero unplanned downtime while improving asset longevity and maintenance costs. Duke Energy is the largest electric power holding company in the US with extensive fossil and hydropower operations in six states. It has four monitoring stations for reviewing the health of its power generation fleet. The ‘Duke Energy SmartGen Program’ introduces the application of IIoT technology for predictive maintenance. The primary reason for the new SmartGen program is to avoid catastrophic failures at power plants. In one case, Duke Energy had a transformer failure that cascaded into other transformers and two turbines, causing over $10 million in damages, plus significant loss of power generation capacity and associated revenue. An assessment of the cause of this incident pointed to the many manual data collection and analysis processes established over the preceding decades, in which meter readings, vibration measurements and oil analyses were recorded on paper. In the case of the transformers, the readings and analysis were performed every six months. The paper documents were filed in cabinets spread across the five legacy companies that now make up Duke Energy. Unfortunately, an issue with an electrical bus accelerated a known minor transformer issue into catastrophic failure within that six-month inspection cycle. • Smart diagnostics and prognostics. • Data integration and visualisation. • Enhanced reliability processes (consistency across the company). • Zero event operations (safety and environmental). The new SmartGen infrastructure also provided a ‘force multiplier’ to leverage the domain knowledge of a few specialists across the fleet of critical equipment. Their technical specialisation and analysis improves reliability and operational performance. For each type of plant, a model was built that helped to identify the sensors needed. The assessment included updating the failure modes and effects analysis (FMEA) for 10 000 assets in 50 plants to identify the critical assets needing monitoring. Implementation occurred in three phases with many of the easier items coming first, and then moving to those requiring more resources. The monitoring and diagnostics system now has over 30 000 sensors, and uses the Schneider Electric Avantis PRiSM APR software for asset health monitoring and alert notification. PRiSM uses machine learning, which avoids the need to develop complex engineered algorithms, allowing Duke to build over 10 000 models. The system gives the company the visibility and decision support needed to focus on the 10 or 20 things that need attention now, out of tens of thousands of devices in the plants. PRiSM recognised a change in overall vibration information. Further investigation suggested that this rotor had a history of blade-to-shroud connection issues. A borescope inspection verified that several pieces of shrouding were missing. Since this was found during extremely cold weather, vibration levels were watched even closer for another change. The unit was taken offline for repairs six weeks later. New sensors, added data and smarter analytics provide alerts that prevent the occurrence of costly equipment damage. A total of 384 finds during three years has conservatively avoided $31.5 million in repair costs. Duke Energy expects the rate of cost avoidance to increase further as it continues to train the machine learning models in PRiSM and adds newer sensor technologies.